In September 2016 I first came to the UK to finish my Bachelor’s degree at Newcastle University. With classes that met only twice a week, I suddenly found myself with a lot of time on my hands. At first I tried finding a job but after receiving my fair share of rejections I turned to volunteering instead. It did not take me long to decide that no matter where I would end up, there would have to be books involved. For as long as I can remember, I have loved books. Librarians seemed surprised anytime I checked out a pile of books that reached so high I could hardly see when I held them. Though the volume has decreased a little since then, I still try to read at least a few pages every day. And if a book captures my attention I have absolutely no trouble staying up past 3 AM ‘just to finish this chapter’. And so my search began. Since I didn’t know anyone in Newcastle, I asked my good friend Google. 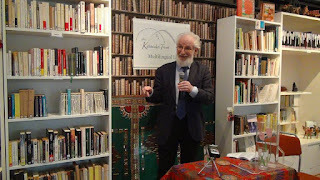 I learnt of a variety of volunteer projects in the area, but not many of them were concerned with books. Until I stumbled upon Borderline Books, that is. One problem: it was all the way in Gateshead (and if I knew anything at that point, it was that you’re supposed to hate everything south of the river). 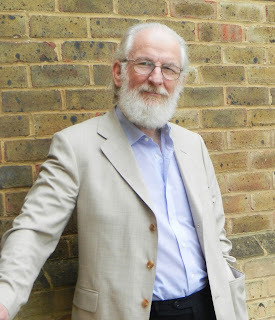 I was almost ready to give up and go into one of the many charity shops – they, too, have books, after all – when I saw a mention of a related project. Something called the Multilingual Library. And, lo and behold, it was in Newcastle! Not only am I a book enthusiast, I am also a bit of a polyglot (Dutch, English, German, French and Russian to be precise, but I also know Latin and Ancient Greek). A place where I would be able to combine the two simply seemed too good to be true. But it had an address and a Facebook page, so I figured it must be legit. And that is how I found myself sending a message asking if there were any volunteer positions available. The reply came two hours later, consisted of a mixture of both Dutch and English, and asked me to come by the next day, just to have a look around the place. I did, and ended up staying almost five hours. From that moment onwards, I came in twice a week. After only a few weeks I started opening and closing by myself, and even security personnel seemed to know who I was. While I liked the work I did at the library (processing and cataloguing books, helping people, hosting events), it was my fellow volunteers who truly made my experience great. I made friends from all over the world and got to hear their stories as well as share mine. With some I shared the experience of being abroad and getting used to British culture, others helped me navigate that same culture by telling me the ins and outs. And if I ever did feel homesick, there would often be someone to speak Dutch with me. In total I spent eight months at the library (October 2016 – May 2017) and I already know that I am going to miss Newcastle. I’ll try to be back whenever I can, but until then: tot ziens! Thanks SO much for all the work you put in A - we miss you already and look forward to your visits in future (with stroopwaffels!) - Hartelijk dank en veel plezier in Nederland. A little late for the first blog of the year but never mind, we have lovely things in store for you. Storytime has started up again with the monthly Polish edition. From 4 March we will also have a regular Arabic storytime - every first Saturday of the month at 2.30. This is a free event - though if anyone feels like dropping a donation in the pot to help cover the electricity costs we'd be very happy. Rainbow Babies will also meet regularly again on the first Saturday of the month at 11.30. 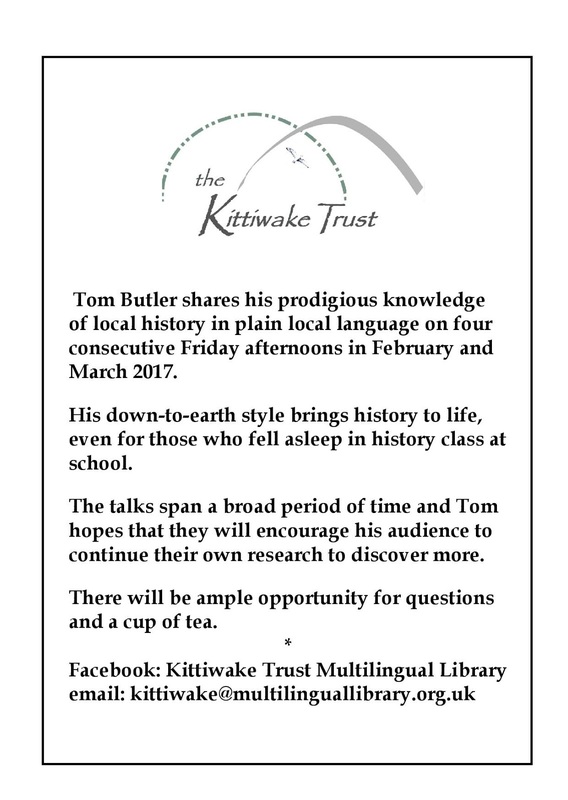 We are also going to host four talks on local history by Tom Butler, a regular member of the library for more than a year now. Tom always had wonderful stories about the history of Newcastle and we all tended to down tools to listen to him. In the end we decided we had to invite him to come and give public talks. These will start on 24 February and be held every Friday at 3pm for four weeks in a row. 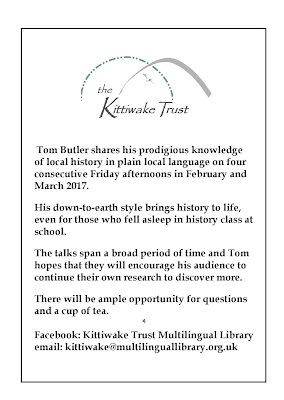 - And look, even if history isn't really your 'thing' Tom will have you spellbound! He is just so interesting to listen to and always has an answer to whatever questions you can come up with - so please come and give these talks a try. He hopes to awaken an interest in local history so that people will continue to discover more for themselves. 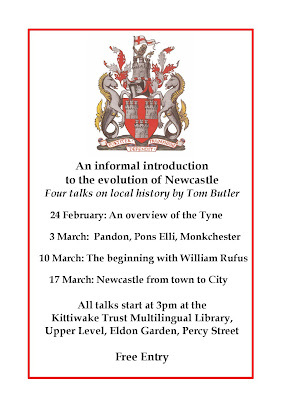 These talks are also free (how nice we are) - not only that, but there will be tea as well. Now that's an offer you can't refuse!